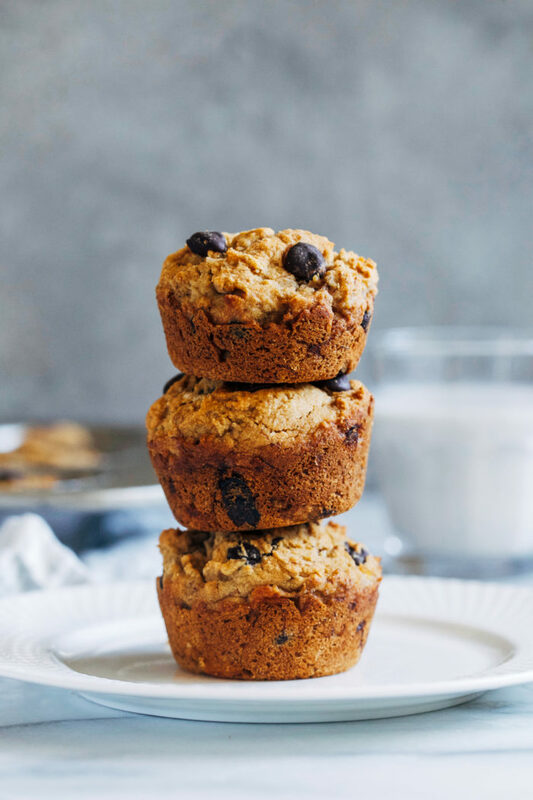 Cassava Flour Chocolate Chip Banana Muffins- all you need is just 10 ingredients to make these naturally sweetened muffins. No one will ever guess they are grain-free! 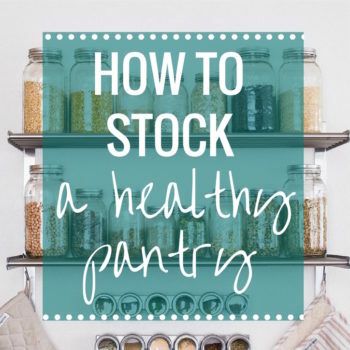 If you’re like me then you might of heard of cassava flour but aren’t really sure what it is or what exactly to do with it. 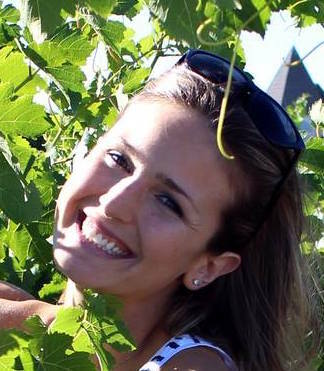 Until recently, all I knew is that they use it in really expensive and incredibly addictive grain-free tortilla chips. If you’ve tried them then you know what I’m talking about. 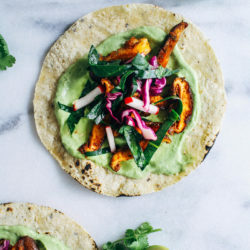 As it turns out, cassava flour can actually be used for all sorts of delicious baked goods, like homemade tortillas, brownies and muffins. It’s from the whole root of the cassava plant which is a woody shrub native to South America. Cassava flour is naturally grain-free and gluten-free, making it an awesome alternative for those sensitive to wheat and other grains. 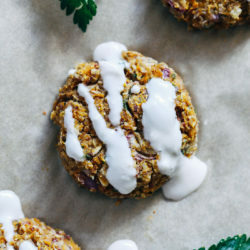 Cassava Flour: I tested this recipe using Bob’s Red Mill Cassava Flour and I couldn’t get over how fine the texture was! It almost looks like all-purpose flour. 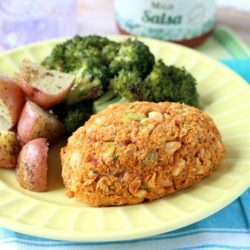 The flavor is also very mild which makes it ideal for baking. 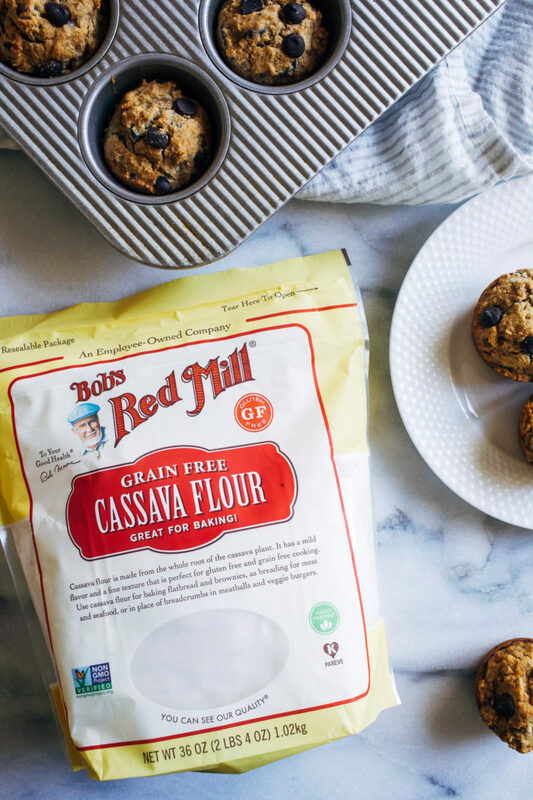 Bob’s Red Mill certifies that their cassava flour is gluten-free as it’s produced in a dedicated facility and is batch tested to ensure gluten-free status. 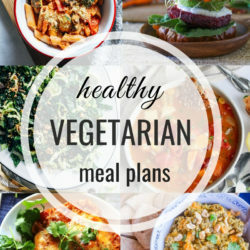 Cassava flour is very unique so I don’t recommend any substitutions here. Bananas: These will provide moisture and natural sweetness for the muffins. If you’re not into banana you could try switching out equal amounts pumpkin puree. Pure Maple Syrup: Using a liquid sweetener is ideal for moisture and enhances the natural sweetness of the banana. I find maple syrup works best as honey tends to be thicker and doesn’t blend as well with the other ingredients unless it’s heated. Coconut Oil: Fat is essential for proper texture of the muffins. Feel free to use a different oil if you like (ideally one with a mild taste) but please don’t leave it out! Egg: Like most grain-free recipes, eggs are necessary for leavening. I haven’t tried substituting with a flax egg but my suspicion is that the muffins would be very dense and not rise properly. Dark Chocolate Chips: You can use dairy-free chocolate chips or chop up your favorite dark chocolate bar. The latter is a good way to control added sugars since most dark chocolate bars tend to have less ingredients and less sugar. Whisk together dry ingredients in one bowl. In a separate bowl, mash the bananas then add the remaining wet ingredients. Pour the dry ingredients in the bowl with the wet and stir to combine. 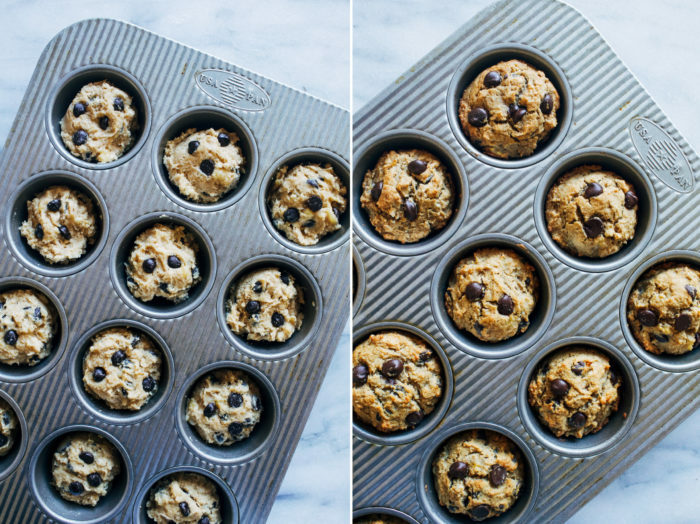 Fold in the chocolate chips, spoon batter into muffin tin and bake. Allow to cool then stuff in your face! The texture of these cassava flour muffins are slightly more dense than traditional muffins but not gummy at all. They are moist and flavorful. I hope you enjoy them! 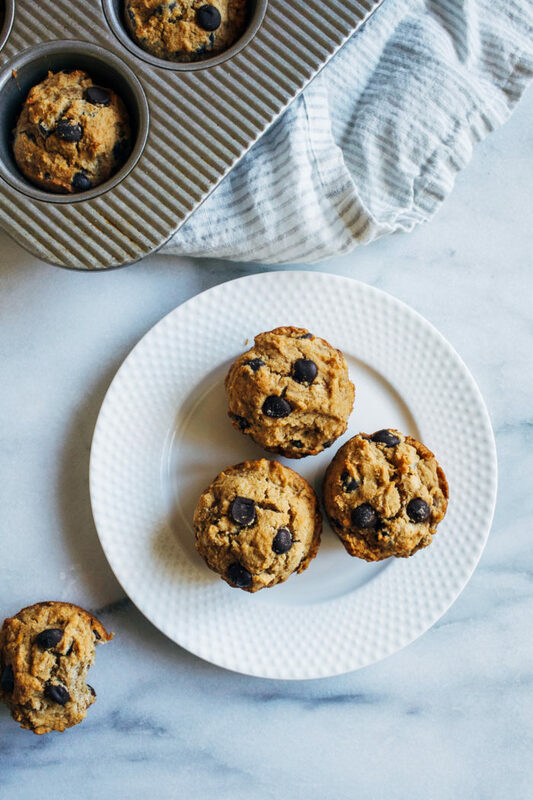 Looking for more gluten-free muffins? Preheat oven to 375°F then lightly grease or line a muffin tin. In a medium bowl, whisk together cassava flour, baking powder, baking soda and salt. In a separate large bowl, combine the mashed banana, maple syrup, coconut oil, egg, and vanilla extract. Whisk together until well combined. Pour the dry ingredients into the bowl with the wet then stir together until the flour is incorporated. Fold in the chocolate chips. Fill each muffin tin about 3/4 of the way full. Bake in the oven for about 22 minutes, until edges are golden brown and firm. Allow to cool for at least 10 minutes before serving. Enjoy! 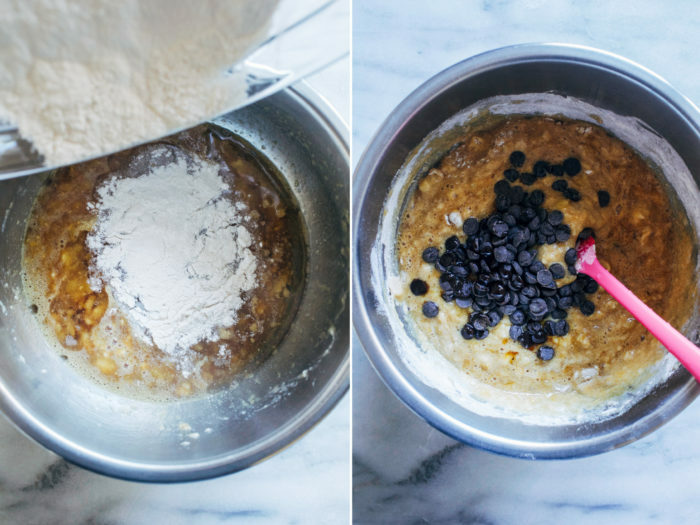 Can you replace blueberries with the chocolate chips? 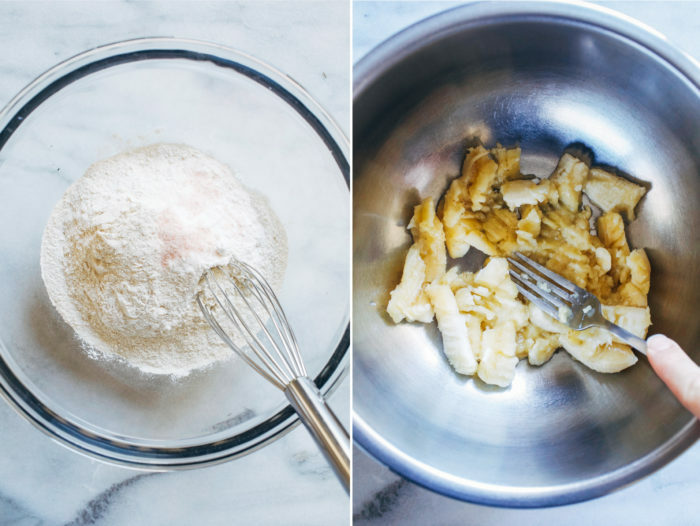 I haven’t really used cassava flour – sounds interesting! 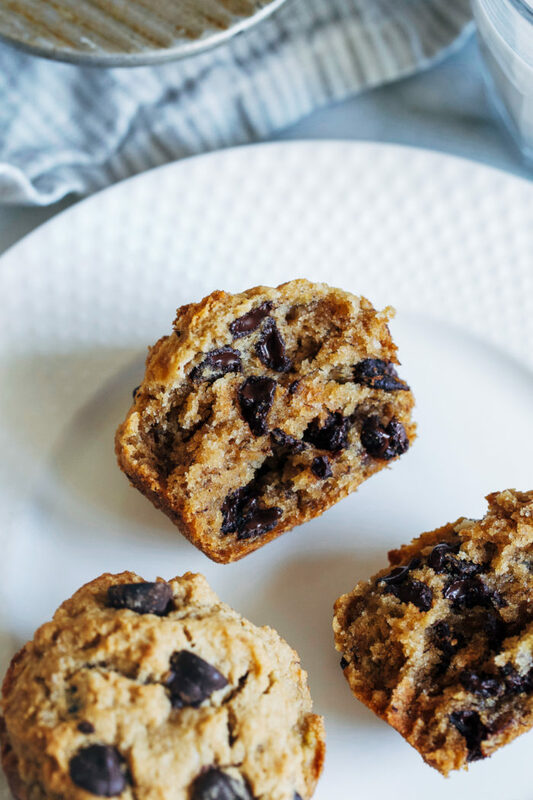 Chocolate chip + banana is one of my favorite muffin combos.. can’t go wrong with it! I made this with a couple of changes. Instead of 1.5 cups of cassava flour, I used 1 cup of cassava flour and 1/3 cup of coconut flour. I’ve found that most recipes with cassava flour perform better with a mixture of flours. I also dropped the amount of oil to 1/4 cup and used 2 eggs instead of 1. Oh and I added a tsp of apple cider vinegar (a little acid to help the baking soda work). 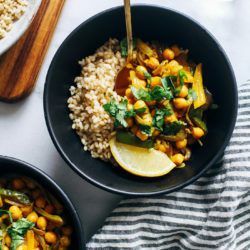 With those changes, this recipe worked beautifully! The result is a muffin that rose really well, and is soft and moist inside. It also holds up well with time, which can be an issue. 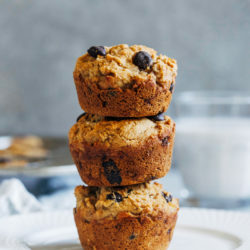 This is my new go to muffin recipe!